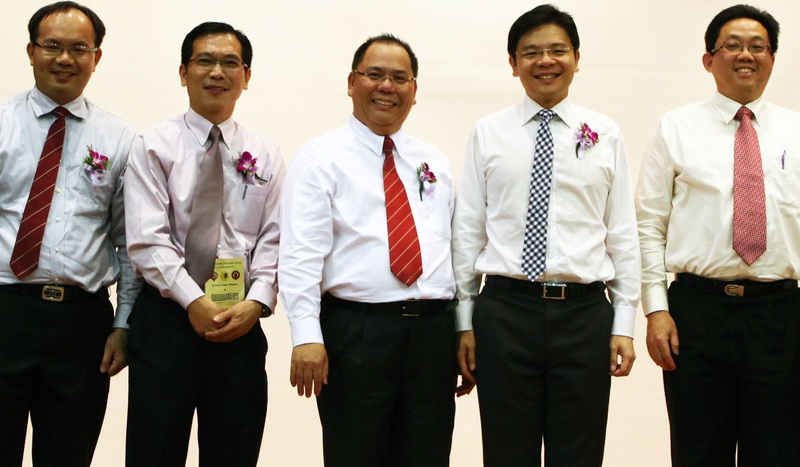 Mr. Chan Poh Meng (centre), pictured at the launch of the VCA-SUTD Social Innovation Partnership. – Mr. Chan speaking to the Straits Times in 1999 regarding the decline of Mandarin in Singapore. Mr. Chan is an ex-Rafflesian, who studied at both the Bras Basah and Grange Road campuses in the 1970s. Much like Mrs. Lim, Mr. Chan started out as a GP teacher, and even has a strong Hwa Chong connection – he was with HCI as an educator for 16 years, leaving his eventual post as vice-principal of the school to become the principal of Outram Secondary School in 1998. While with Outram, he oversaw its transition to a $27 million new campus located atop York Hill. In 2006, Mr. Chan became the principal of VJC, a position he has held till this day. He was one of the main driving forces behind VJC becoming a seamless 6 year Integrated Programme school in 2012, via the Victoria-Cedar Alliance. Unknown to many, Mr. Chan also has an artistic side – he apparently acted as an “enigmatic VIP” in a 1991 bilingual production put up by Hwa Chong alumni! – Mr. Chan speaking to the media in 1995 about non-Chinese students in Hwa Chong. Mr. Chan takes over at what could be considered a crossroads in RI’s 190 years of history, amidst growing calls for a more equitable educational system, and what has been a government-led shift toward a more expansive definition of success in Singapore. We would like to welcome Mr. Chan back into the Raffles family of schools, and wish him all the best as we forge ahead toward a brave new future. WELCOME MR CHAN! Great to have a Rafflesian in charge of the school. Only a Rafflesian can understand the gravity of his responsibility and bring this proud institution back after this 6-year period. All the best Mr Chan! You make it sound like Mrs Lim’s reign in RI for the past 6 years, has been a bad thing. Firstly, let me point out the factual error in “Only a Rafflesian can understand the gravity of his responsibility”. Mrs Lim was, in fact, a student in RJC, and thus she is a Rafflesian. Secondly, without Mrs Lim, RJC and RI would not have re-unified, and the Raffles Diploma would not have been created. You said ” bring this proud institution back”. Under Mrs LIm, RI’s results in the A-Levels have improved to even greater heights. Also, RI has been performing well in both sporting and aesthetic competitions. Results aside, I personally believe that Mrs Lim has been a great principle. She’s always been there to support us, and does care for us students. At almost every inter-school competition, she would be there cheering us on. If we won, she would congratulate us for our win. If we lost, she wouldn’t blame the players, but instead commend them for trying their best and for displaying Rafflesian Spirit. Mrs Lim is not a person who looks only at results, she sees our efforts. And even if she wasn’t a Rafflesian, does it make a difference? Are her efforts then rendered invalid? I may not know Mrs Lim well, but we all know that Mrs Lim has tried her very best to lead our school, and she has done an amazing job. Dominic, if you can’t realise Mrs Lim’s contributions to our school, you shouldn’t be criticising her of being “incompetent” or “not understanding the gravity of his(her) responsibility”. Without doubt, Mrs Lim has brought RI closer to “a better age”, and none of us can deny this fact. Mrs Lim is the best principal RI ever had. Had worked with through ORA and I can attest to it..
Moving on, LLC’s reign in RI is almost thoroughly hated by recent alums. Why? She alienated many alums by disallowing us from returning to the school to use its facilities on weekends without prior booking. Note that students were not using these facilities for training on weekends. She shut down many CCAs in her first 3 years because they were underperforming/not getting medals for the school – Wushu and Tenpin Bowling are two prime examples. She decided to disregard 180+ years of pride in our school colours of green black and white, and decided to change it to black and gold instead. She built that horrible glass building which cost a huge amount of money. The Raffles Diploma means absolutely nothing, even in your university applications. To console students instead of blaming them is a skill, known as public relations. Shutting down CCAs for not bringing the school glory speaks for itself. If all you have to show after 6 years is ‘even greater heights’ in the A levels, the question now is this: who has contributed to the A level results? The teachers and the students, or the Principal? Will the school have continued to do well without LLC? Undoubtedly. Mrs Lim is a great and insightful leader and a wonderful person. The Raffles Diploma is a well-thought-through program which will help create a more holistic person. However, it is only as good as the integrity of the teachers who administer it. That will mean you can work your life off to satisfy the guidelines and yet not be given the desired grade if the relevant teacher does not approve it based on personal reasons. Congrats To Chan Poh Meng !! He was my classmate in Sec 2A in RI and we remained good friends throughout the Raffles days .I hope to organize a RI reunion for my cohort and we will all be pleased to meet him then.